Straight-ticket voting is usually an advantage for the majority party, which is one reason why a Republican Texas Legislature has left that voting law in place in spite of steady attempts to change it. But what if the person at the top of the ballot is unpopular? Texas is one of only nine states that still allow general election voters to cast their ballots for everyone running under a particular party's banner in one fell swoop. 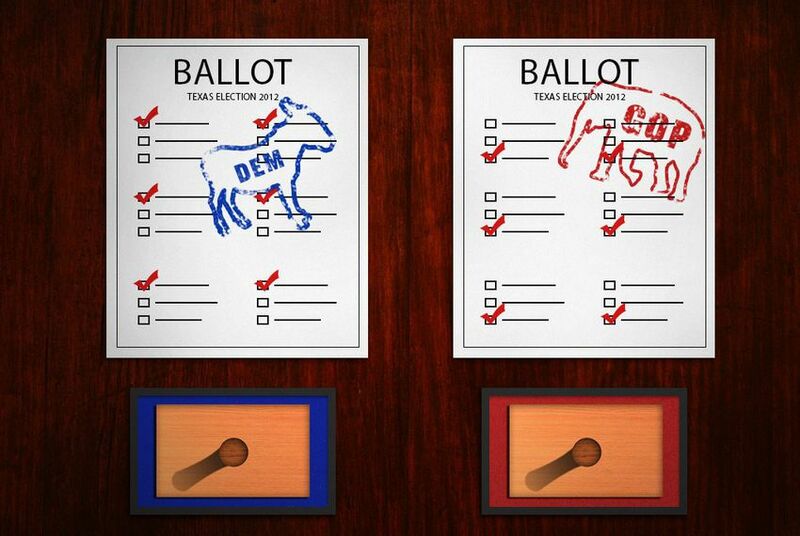 Pull a lever, fill in a bubble or push a button for the party of your choice and you’re done. That is usually an advantage for the majority party, which is one reason why a Republican Texas Legislature has left the straight-ticket voting law in place in spite of steady attempts to change it. But what if the person at the top of the ballot is unpopular? Both Donald Trump and Hillary Clinton have higher “unfavorable” numbers than the Zika virus, and candidates below them on the ballot — particularly in the state’s scattered swing districts — are already reacting. They’ve turned to an old page in the campaign playbooks: Disown unpopular candidates on your own ticket and try to marry the bad ones on the other ticket to your opponent. It’s hard enough to run from the top of your ticket if voters are moving through their ballots one race at a time. The straight-ticket option — with unpopular candidates perched at the top — could skew the results of down-ballot contests. A straight-ticket voter who doesn’t like the top candidate can still vote for the GOP ticket and then manually opt for some non-party candidates, switching parties in one or more contests or just writing in the name of a favored contestant. In big counties, like Dallas and Harris, the straight-ticket ballot poses a problem for the GOP. State Rep. Ken Sheets, among others, has tried unsuccessfully to exempt judges from straight-party voters. He’s a Dallas Republican, and while his district is (slightly) red, his county has swung to the Democrats. Because of straight-ticket voting, that means the courthouse, once dominated by his party, is now controlled by Democrats. Six states have rid themselves of straight-ticket voting since 2010, placing Texas in an ever-shrinking club. People who’d like to dump straight-ticket voting contend that some of those Republicans were actually better judges than the Democrats who replaced them. Democrats, it should be said here, made the same point when the winds of change flipped the county courthouse to the GOP in the 1980s. Michigan dumped it in January. Opponents there said straight-party voting encouraged people to ignore individual candidates and to simply choose their parties instead. Sounds like Dallas County, no? Straight-ticket advocates said it shortens lines at polling places, enfranchising voters; this plays on the idea that ballots are way too long and largely a waste of time. Why not turn things over to the folks in the party primaries? They also said there’s no way to prove that voters were uninformed about their choices just because they were so single-minded. Utah’s latest attempt to take the party choices off the ballot died in a legislative committee earlier this year. Its sponsors argued that people would still have been able to vote a straight ticket but would have had to do so one candidate at a time. They claimed getting rid of it would energize voters. Opponents said eliminating the practice would have made reading the ballot harder for elderly voters. Back in Texas, Sheets and others like him in about a dozen federal and state legislative races could have particular reason to fret. He is running in a district where the average statewide Republican candidate beat the average Democrat by only 4 percentage points in 2008 and just 5.1 percentage points in 2012. He’s been successful in several hard election years, but it’s the sort of district a Democrat could win if Sheets or someone else in his party makes a big mistake. His skinny little partisan margin is also vulnerable to outside influences, like a sudden influx of campaign money from the other side or a particularly odious outburst from that New Yorker at the top of the ticket. He depends, to some extent, on Dallasites willing to split their tickets, voting for their preferred candidates no matter which party they represent. Fewer Democrats than Republicans currently represent the state’s handful of swing districts, but there are probably places where Clinton presents the same danger to candidates from her party. A bad candidate could be harmful in the same way that a popular one helps. In 2008, a big boost in Democratic straight-ticket voting in El Paso County in favor of Barack Obama swamped incumbent Republican state Rep. Dee Margo and helped put Democrat Joe Moody in the Texas House. You get the idea: The influence from the top races is certainly not enough to matter in most races, but it might matter in some. And the straight ticket makes it harder for anyone whose victory in the fall depends on informed ticket-splitters making their way carefully through their ballots. Catherine Wendlandt provided research assistance for this story.